Hello all you most excellent people! This will be one of the last posts from a computer residing within the United States because I’m about to move to JAPAN!!! That’s right, RAMPAGE TOYS is up and moving to the ‘Toy Mecca,’ the home of Godzilla, Heddorah, King Ghidorah, and all those other great Giant Monsters – not to mention the birthplace of all the greatest Soft Vinyl toys EVER! Not to worry though, this move only means great things for production. I’ll try to keep on top of the small resin releases. I’ll also be moving into the world of Soft Vinyl – releasing the UGLY UNICORN around the end of August! If you are in Japan, look for me at some of the upcoming shows – I’ll be at Super Festival with Velocitron (Ricky Wilson – who is doing the production work in Tokyo for the UGLY UNICORN) and his fellow Sofubi Producer ILANENA, and I’ll get more information up about that as soon as I have it! What I know now is that I’ll have a spread of OG paintings,Prints, Resin Toys and the first release of UGLY!!! A RAINBOW of Flex Packs. The last batch of the Flex Packs will come in 6 solid colors, all cast by me - RAMPAGE TOYS. The first sets I personally casts, the only sets to be cast in opaque resin and the last sets that will be made! 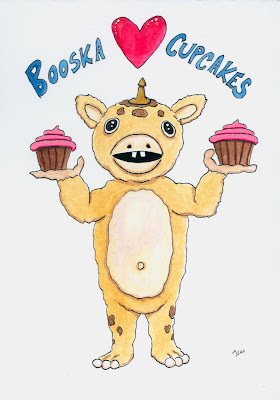 Booska LOVES Cupcakes! So, yeah, he NEEDS Ramen Noodles to survive, but that doesn't men he doesn't love cupcakes! This is one of the pieces I did for the show at Cakespy in May. 5x7 - Pen, Watercolor and Acrylics on Archival Paper. 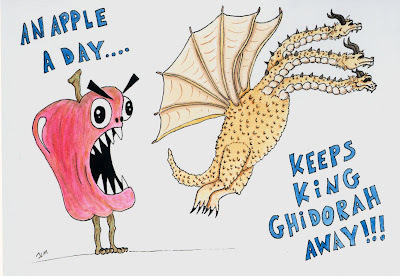 Another one of the pieces I did for the show at Cakespy in May; this is part of a series of 5 paintings - all with the same 'apple a day' theme. 5x7 - Pen, Watercolor and Acrylics on Archival Paper. I'm sure I'll get one last update up before I head out of the country, so keep your eyes peeled! 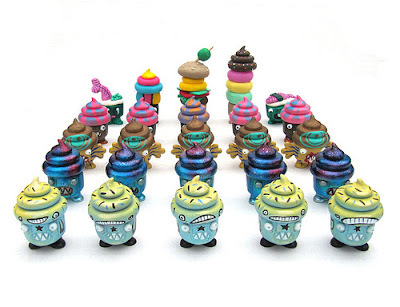 The TENACIOUS TOYS x RAMPAGE TOYS mini kaiju cupcake series is live in the TENACIOUS TOYS webstore! This VERY cool blind box series was based on my 2 inch mini cupcake kaiju platform! We hand picked four great artists (and I did some as well), and had them each do 5 pieces - making a total of 25 custom resin toys. The figures were blind boxed by TENACIOUS TOYS with some screen printed packaging art that I supplied. The series went live last week on the Tenacious Toys Website - $35 per piece with possibility of finding a GOLD TICKET!!! The lucky person who finds the gold ticket will get a little RAMPAGE TOYS care package to include a 5x7 OG painting and some other special one-of-a-kind goodies (toys!). 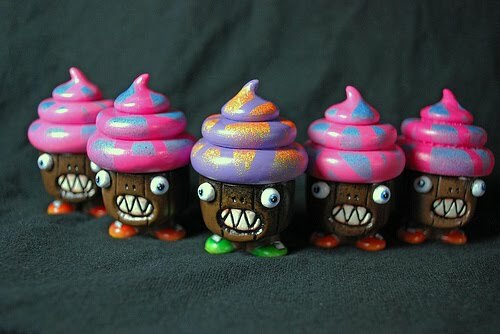 Go ahead and grab yourself some mini-cake art-toy awesome - and tell all your friends about it!!! Below are some images, but there are even more on the TENACIOUS TOYS website!